The research base, provided by ORC, will come from the TILMAN-ORG and OSCAR projects. 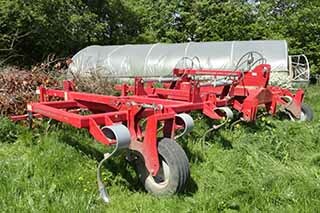 The host farmer Richard Gantlett sold his plough in 2004 to focus on alternative methods of cultivation. They use a modified Lemken Thorit with Bourgolt shears for sowing with simultaneous weeding, a Kongskilde Virboflex is used for shallow cultivations and a Maschio Pinocchio for remedial deep lifting. The field lab will be based on the farm which was a case study in the IOTA review of NIT and how the methods used have evolved. A greater understanding of the current research and thinking on NIT techniques. Plans for their own farms/holdings. A chance to feed into research ideas and needs around NIT.